REEL CONSERVATIVE: The Lord of the Rings animated "trilogy"
Peter Jackson wasn't the first to put J.R.R. Tolkien's books on film. Two decades before the first of Jackson's live-action/CGI films hit theaters, three animated films were crafted in the space of three years, and by two different animators. The first two are well worth checking out but the third is not. The Hobbit was the first Tolkien book to be filmed, in 1977. Director Authur Rankin chose a particularly cartoonish style of drawing that made it clear from the start that this was intended as a children's film. But his work had some humor to it – just as the source material does – which makes it pleasant enough viewing for adults too. Our hero Bilbo Baggins is a Hobbit, creatures that look much like humans, though they are half as tall and have far hairier feet. Normally Hobbits like nothing better than to stay close to home, but when the wizard Gandalf brings 12 treasure-seeking Dwarves to his doorstep Bilbo signs up for the adventure. And with the help of a magic "ring of power" Bilbo finds, he helps his new friends fight Orcs, Elves, and even a dragon. At 77 minutes long, readers of the book may be disappointed as to just how much the film condenses the story. However, as children’s films go it is quite a nice one, and a good introduction to Middle Earth. For a children's film there are some fairly scary bits, including attacks from Orcs, giant spiders and a "Gollum" so this isn't suitable for the very young. 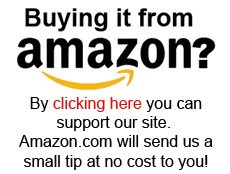 You can buy a copy at Amazon.com by clicking here. 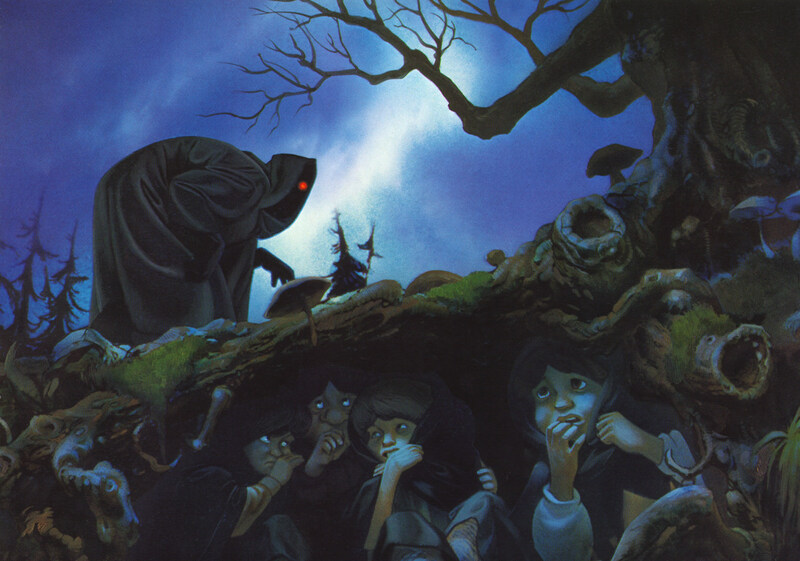 A year after The Hobbit was released another animator, Ralph Bakshi, decided to try his hand at The Lord of the Rings. The story begins with an aging Biblo Baggins passing on his magic ring to his nephew Frodo. Shortly after the wizard Gandalf shows up to warn Frodo of the ring's danger. It turns out this ring is so powerful that whoever holds it could use it to rule the world. This is why the evil Sauron wants it, and why the good Gandalf knows that it must be destroyed – this all encompassing power is too much of a temptation for even the best of men to contend against. It is up to Frodo, who as a little Hobbit is far less tempted by the pull of power, to take the ring deep into the enemy's lands to destroy it in the lava of the mountain where it was first forged. And on the journey he has the company of hobbits, men, an elf, a dwarf, and a wizard to help him. Animator Ralph Bakshi used a style of animation that involved filming scenes with real actors and then tracing over each frame of film to create a line drawing picture of it. This "rotoscoping" allowed Bakshi to incorporate the endless possibilities of animation with the realism of live action. The realism also meant that this is a scarier film than The Hobbit. The lurching Ringwraiths (see the picture) are freaky, and some of the combat scenes, especially at the very end, are quite bloody. Though this is animated, it is not for children. There is one major flaw with the film: it is only the half of the story! The director planned it as the first part of a two-film treatment, but the second film was never made. So things wrap up abruptly, in mid-story. But while it lacks a proper ending, the story it does tell is intriguing. This is sometimes treated as a sequel to Ralph Bakshi's film, but it isn't. Arthur Rankin directed, and he returned to the cartoonish animation style of The Hobbit. And while the events in this story do, loosely, follow after the events of the Bakshi film, Rankin seems to have been envisioning this as a sequel to The Hobbit, so he begins with an overview of everything that took place between it and The Return of the King. Or, in other words, it begins with a quick summary of two 500-page books – as you might expect this overview doesn't do justice to the contents of these enormous books, and the continuity of the story is lost. If a viewer isn't already familiar with the books he'll have no idea what's going on. Things don't get any better once the overview is complete - there is no flow to the story. Huge plot elements are skipped over, and random bits of scenes are stitched to other scenes with stilted narration and cheesy ballads. In addition, Frodo Baggins twice calls on God to help him. Some might argue this could be an appropriate use of God's name, but in the context of a fantasy world in which God is never otherwise mentioned, this seems a misuse. The Return of the King is, in short, a dreadful film that is not worth anyone's time. Hey dude, where did you get that pic from Bakshi's film? It looks so nice and smooth, like some sort of enhanced new remastered version. Or else a fan made pic, in which case I would say bravo to the artist.